Until the early 20th century, Nacional was widely grown in Ecuador and famous worldwide as luxury chocolate. In 1901, the rampant disease struck the Ecuadorian cocoa fields, and the bean became extinct for over 100 years. In 2008, the bean was rediscovered in a hidden mountain valley on the Marañón River in northern Peru. Nacional beans were named the “rarest cacao in the world” by the New York Times. Anthony Bourdain’s iconic, No Reservations, covered the cacao farm and in one of their episodes. The white beans produce an intense chocolate aroma and mellow richness that lacks the usual bitterness of cacao, making this bean a chocolatier’s dream. 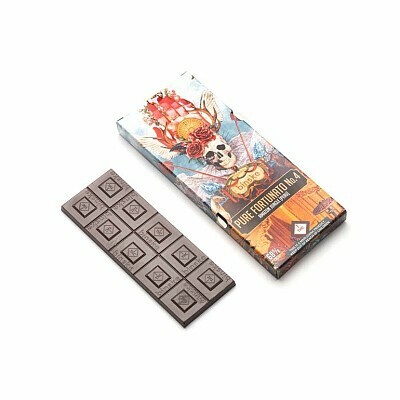 Distillate infused chocolate bar made from the rarest cacao in the world- Peruvian Nacional!